Recieved my order in a very timely manner. The quality of this vinyl is great. If you are interested in owning your own customized flag, or want to produce some in bulk, just provide us with your personalized details in the form below, and we will get you a quote! 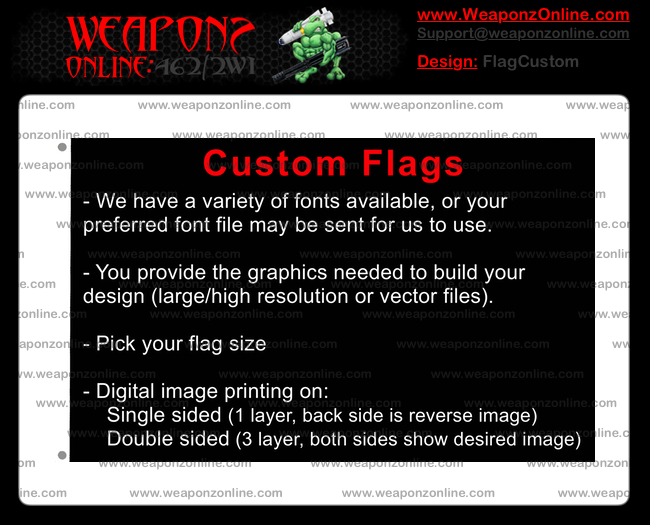 All you will need to do is provide us your designs, in either a complete ready to go file, or multiple design files that we can use to build your flag. We do not typically create designs from scratch, so there are no artwork fees. We will still gladly help you get something made with any files you have already. The larger and higher quality the logos are, the better. If you live in the U.S. or have an APO address, you get free shipping! We use high quality, 120gsm superknit polyester, with double stitched edges on sizes 3'x 5' and up.